Samsung Galaxy S5 was launched at price of £579 in UK. The Samsung Galaxy S5 comes with some improved Specifications and features. Samsung has changed the design of the phone, which makes it apart from other handsets in the family. The handset comes with 5.1inch Full HD Super AMOLED display, which would make many of you despondent as many were predicting it to be a 2K resolution phone. The handset comes with a finger sensor, S health 3.0 and heart rate sensor. The company has made many changes on the hardware side. The handset also has Infrared LED with which you can control your smart TV. 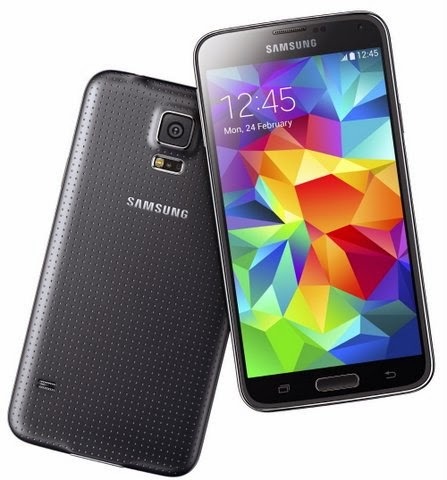 Samsung Galaxy S5 2GB of RAM and comes with 16GB / 32GB internal storage. The handset is capable of recording 4K video with its 16MP primary shooter. It runs on Android 4.4.2 kitkat and is powered by 2.5GHz Snapdragon 801 processor. There is 2800 mAh battery to make the handset alive, which should be enough for normal usage.The price of the phone is not announced yet. At £59 upfront, EE is selling Samsung S5 on a two year and £39.9 a month contract. The EE offers 2 GIGS of 4G data and access to LTE network in the UK. T-mobile monthly costs £28 for unlimited 3G data and 500 minutes, for that you have to drop £230 on the phone upfront. Orange offers something better. Orange reduces upfront to £199 and gives 1,000 minutes but limited 500MB of DATA. You can Grab Galaxy S5 for £47 per month from Vodafone. The contract will last for two years and you will get 2GB of 3G data. If you want Vodafone 4G network the S5 can be owned for £52 per month contract with no down payment. This plan will offer unlimited calls and 5GB of Data. In Three you will get 4G at no extra cost, if you pay £ 29 up font and £ 41 thereafter you can enjoy internet. At £29 upfront and £38 per month on 2 year contract company offers unlimited data and 600 minutes. Samsung Galaxy S5 Virgin is a good deal. You will get more benefit if you have Broadband through Virgin Media. The cheapest monthly contract comes at£29 with £99 payment upfront. The plan offers 250 texts, 250 MB of 3G data and 100 min of call. IP67 ratings for Dust and water Resistance.